Looking to find the best drone on a tight budget? Good News, since today we are reviewing the 10 Best Drones Under $100 currently available on Amazon. Budget drones have come along way in the past 5 years, and we are sure that for under 100 dollars you can find a camera drone suitable to anyone and at any budget. We all want to spend our money wisely, getting the best value for our investment by making sure we purchase a durable, efficient and fun product. Let’s do it! What should I expect from a drone under $100? 1. DJI Tello – The Best Drone for $100! 2. Eachine E58 – The Best Looking Drone under $100! For those of you in a hurry, here is our top 3 drones for less than 100 dollars. "Coolest Drone in the Review"
Also see our post: Best Drones Under $200, if you find yourself with a bit more money to spend. In order to get the best bang for your buck, it’s important to be aware of the average specifications and features of the products under such price and category. Batteries and drone’s firmware have become much more efficient in the last couple of years. Therefore, you should expect an average flight time of 7-10 minutes. Some brands prioritize flight time while others focus on other specs. However, keep in mind that drones with better cameras will have shorter flight times. It is one of the most commonly highly prioritized specifications by drone enthusiasts. Of course one wants to have a long range when investing this amount of money in a drone. Fortunately, the control distance is increasing. Nowadays, an average control range for a product within this budget is around 70-100 m.
Of course, you must know that performance from any drone on this list is not going to be as great as a drone under 300$ for example. Accurate controls should be expected, but windy days must be avoided if you expect steady hover even without any pilot’s input. We have only picked the quads that have top of the line performance when compared to other same price products. As technology advances, more features are added to drones as companies compete with each other for sales. Therefore, all $100 drones in this review already come with a wide variety of features. Expect a decent amount of drones to feature Follow Me, Live Video, and the ability to do tricks. Our most important feature is obstacle avoidance since you don’t want to crash your 100 dollar drone! Most of these drones come with HD 720p cameras. They are able to produce good quality image footage, although live video streaming might have some latency. They are definitely able to record amazing footage for home use. 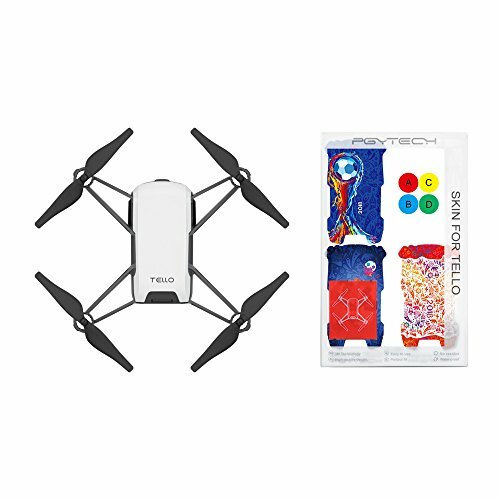 What if I told you that the DJI is currently offers a drone, the Tello, is a feature-rich, compact and extremely capable sub-100 dollar drone. That's right, a DJI endorsed drone for under $100?! We thought they would stick to drones in the 1000 dollar price range. One of the first things that stand out about the Tello drone is that they have made it simple to fly. Feel safe with the Tello, even if you have never flown a drone before, we're certain that you will pick it up quickly. For experienced and more confident pilots, there are enough bells and whistles that will keep you entertained. It is a quadcopter that looks remarkably similar to the outstanding and extremely popular DJI Spark. The similarities don't end there but more on that later. Let's get to know more about it's features. The camera is also good for a drone in this budget. The Tello includes a 5MP camera with an 82.6-degree field of view and shoots 720p video at 30 frames per second. The Tello also has digital image stabilization (EIS) for significantly less blur and enhanced footage on the go. The Intel processor ensures excellent footage. The Tello drone has EZ Shots to make the camera much more accurate. This makes shooting easier and more enjoyable. The drone streams to a tablet/smartphone or a VR headset. Bounce Mode - The Tello bounces up and down from your hand or any other surface at heights between 1.6 ft and 3.9 ft. I think we haven’t forgotten any! It’s that overwhelming. Truly a feature-rich quadcopter, there is no other budget drone under $100 that can compare to this. Editors Award -This drone clinches the award as our best drone under $100. DJI's reputation precedes itself, and the user ratings on Amazon agree. If you are looking for a great budget drone, just get the Tello, you won't be sorry. The sleekest looking pocket drone on the market. Its design is based on DJI Mavic Pro, one could even say a copy of the famous DJI quad. Eachine E58 packs a 2MP camera and can transmit Live Video via WiFi. The Eachine E58 is a very stable quadcopter that fights the wind efficiently. It’s beginner-friendly but not not the fastest drone on the market. At it's top speed it flies as fast as a brisk walking pace, but still remains easy to maneuver. Each battery charge will last you around 10 min, but the deal we have linked to comes with 3 batteries all for less than 100$! E58 has some interesting specs, for example, the maximum flight time of 9 minutes (battery only takes around 1 hour to fully charge). Maximum control range is 100 meters, although FPV range is only about 30 meters. The built-in camera is surprisingly better quality than we expected and the Live Video transmission has no lag, which is an amazing detail in our opinion. This no lag FPV transmission is due to the fact Eachine E58 records directly to the microSD card, thus preventing any lag issues (you cannot record the video directly to your smartphone while flying). The camera is 2MP with 720p resolution and wide angle. Out of Range safety (if you go out of range it starts to descend). Assembly takes less than 10 min. "Ideal For: ​Everyone, including FPV Racers"
It’s one of the best drones under $100, it has been a top rated bestseller ever since its release. Most likely you have already heard of it before. Luckily, this amazing drone is still available in the market and its price has followed the market; amazing value for the money, comes with a complete FPV package. There’s a reason why Hubsan H107D remains to this day one of the most sold drones in the market. It performs way above average and is a favorite to buy for someone as their first quadcopter. Steady hover, responsive control, at an amazing price. We did an in-depth review on the Hubsan HD107D X4 for those who are interested in reading more about this drone. H107D specifications are above average. It has a maximum flight time of 9 to 10 minutes and a maximum control range of 100 meters (same for the 5.8Ghz Video Image transmission). The fun wouldn’t be complete without a camera and Hubsan X4 does comes with a built-in 0.3MP 480p resolution camera with surprisingly good quality. Capable of recording video and taking photos, the camera can also transmit Live Video directly to the 4.3” LCD screen built-in into the remote controller itself (see image). No need to use your smartphone as a FPV monitor. The remote controller comes with its own! Hubsan X4 H107D does not include any features besides 3D flips and Live Video. "Ideal For: Intermediate, Experts and Racing Beginners"
For all the amateur drone racing enthusiasts getting started, we are happy to tell you there’s a highly affordable and highly fun alternative in the market. Of course it’s a simple toy racer, but it’s great for practicing faster flying. ​HS150 is a toy racer drone for beginners. However, keep in mind it’s for beginners at drone racing, and not beginners at flying a drone for the first time. This being said, HS150 Bolt Bee is surprisingly fast, able to hit 50km/h (31 miles per hour). Highly maneuverable, it’s a great indoor racer but can also be flown outdoor if there’s minimum wind. It features 5 different speed modes (high to low). Besides the already mentioned 50km/h speed, HS150 has decent specifications, for example 7 minutes’ flight time per battery (comes with 2) and a control distance of around 70 meters; thus better for indoor racing. A basic 2 MP camera, capable of shooting in 720 p HD resolution. Since it’s a racer drone, built for speed and agility, it of course isn’t focused around features. However, it does come with Headless Mode and 3D Flip. Features a complete ready to fly out of the box package with 2 batteries, 3.7V 600Mah Li-Po (1 bonus). Visou goes by many names on Amazon, including GordVE, Aurelio, Leaningtech and ZWN. Due to the product’s popularity, many brands resell it under a different name. Why? 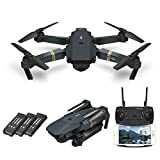 Because for a very low price you can get a foldable drone with a built-in 2MP camera with a 120º wide angle; Live Video has a long transmission. As expected from a widely popular quadcopter, the XS809W performs very well, both indoor and outdoor. At lower speed it’s very easy to maneuver and hovers steadily. At high speed it becomes fairly maneuverable and one could even say a bit acrobatic. The drone can be controlled via 2.4Ghz remote controller (included), or via smartphone through an app. The XS809W has a maximum flight of 7 to 9 minutes, which is pretty good considering its price. Maximum control distance is 80 meters but in proper flight conditions with a good condition it can reach 100 meters. FPV transmission is surprisingly good, working as far as 80 meters. One of the most fun characteristics of XS809W is the built-in 2MP 720p 20fps resolution camera. Unlike most cameras under $100, this one doesn’t have a narrow angle, instead featuring a 120º FOV(Field of View) lens. Live Video is transmitted in good quality directly to the pilot’s smartphone screen via WiFi. 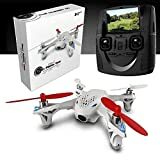 Another popular drone aimed at beginners and the entire family! Great to fly outdoors. Current drone is one of the best drones under 100 dollars. Can be flown indoor but the outdoor experience is much better. Almost the perfect drone for beginners. Has a very steady hover and is easily maneuverable, thanks to the 6 Axis Gyro system. It has 2 speed modes (high and low). At low speed, X708W is the ideal drone to practice before moving on to a higher-end drone. The X708W specs are actually very good and may be please most pilots that prioritize a focus on specifications. Maximum flight time is around 10 minutes per battery, while maximum range is 100 meters. The image quality of the X708W’s built-in camera is actually surprisingly good, both recorded video and Live Video displayed on the smartphone’s device; 720p resolution. This Live Video is done via WiFi directly to pilot’s device. Live Image is lag-free, unlike most FPV drones under $100 that have image latency. "Ideal For: Beginners and Intermediate Pilots"
A product that combines portability with entertainment. GoolRC T47 packs 2 awesome particularities, the foldable design (fitting in a bag or backpack) and a G-Sensor Control (e.g. Nintendo Wii Remote). You can pilot T47 via smartphone or G-Sensor Control. When using the smartphone, the quad is simple and straightforward to control. However, if you want to pilot with the G-Sensor Control (included), it does have a bit of a learning curve, we don’t advise that mode for beginners and kids. Specs are right on the average for a drone within this price range. Flight time is 7 minutes per battery (package includes a bonus battery, which is a neat extra). Control distance is 80 meters, with the Live Image transmission topping at 30 meters. The camera is standard VGA quality with 720p resolution. It’s capable of recording videos and taking photos. It also transmits Live Video directly to the pilot’s smartphone via WiFi through a free to download app (available for Android and iOS). Live Video is decent quality but can occasionally have some latency. GoolRC T47 comes with a standard set of features including Headless Mode, Altitude Hold, Gravity Sense Control (remote included in the package), Live Video, Beauty Mode (in-app feature to enhance photos and video), and 3D flip. Nothing fancy, but the G-Sensor Control and Foldable Design sure are the highlight of this quadcopter. A pocket drone equipped with Live Video transmission. Great for kids and beginners, HS160 is capable of folding and fitting any pocket or backpack. Extremely easy to carry, the remote controller even comes with a holder for the pilot to place his phone. Suitable for both indoor and outdoor flight, HS160 is a great drone to carry around with you anywhere. Can be easily flown by kids and beginners due to the its steady hovering (doesn’t require much pilot input to hover in same place without falling to one side). It comes with 4 different speeds (high to low); for beginners, intermediates and experts. Flight time is its best spec, each fully charged battery (3.7V 500mAh Lipo) allows up to 9 minutes of fun flight. The maximum control distance ranges between 50 to 70 meters, while the WiFi Video transmission range is only 30 meters. I would not consider this a long range drone! The built-in camera is a standard VGA camera (despite manufacturer advertising HD) and it has a 720p resolution. Besides taking photos and recording video, the camera can also transmit Live Video directly to the pilot’s smartphone device via WiFi through a free to download app (Android and iOs). "Ideal For: Kids and Beginners!" One of the newly released quadcopters in early 2018, it’s a fun little drone (13.21 x 13.21 x 4.06cm) meant for beginners. It’s one of the cheapest currently in the market and definitely easier to control than the Syma models. As already mentioned HS170G is aimed at beginners. Great for the indoor and outdoor flight it has a very stable hover thanks to its 6-Axis Gyro System (present in practically any toy quad). It’s responsive and can be fairly steady without much user input (thus its ease of use). It is able to fly in 3 different speeds (high to low). HolyStone HS170G has slightly below average specifications, but we must point out its priced below $50. This being said, HS170G has a maximum control range around 70 meters (perhaps can hit 80m but we wouldn’t advise this to beginners). Flight time is a good 7 to 8 minutes when powered by a 350mAh (included) or 380mAh battery. It’s important to highlight the 2.4Ghz remote controller. It is one of the best and more comfortable among under $100 drones. Its ergonomic style enhances the flight experience and is a nice detail. No camera on this model. "Ideal For: Beginners, Intermediate, Experts. Also FPV Beginners"
One of the most positively reviewed drones. With close to 2000 customer reviews, MJX X400W is one of the most popular WiFi FPV quadcopters currently in the market. 5mph. Features 2 speed modes, the fastest yaw-speed enables the quad to be more maneuverable and a bit acrobatic. It can be flown both indoor and outdoor. One of the best characteristics of this drone, besides the ease of use, is without a doubt its specs such as flight time and control range. Flight time is around 8 to 9 minutes (powered by a 3.7V 750 mAh Li-po battery); takes about 120 minutes to fully charge (USB). The control distance goes as far as 100 meters. The X400W comes with a standard C4005 FPV camera. Good enough to take decent quality aerial photos and videos, but nothing too fancy. However, it does enable Live Video transmission via WiFi directly to the pilot’s smartphone device through a free to download app. If you are searching for a drone with an amazing camera take a look at our drones under $300 review, where you will find its bigger brother, the MJX Bugs. This drone mostly focuses on useful features to enhance the beginner’s experience. Note: The X400W is compatible with a 3D VR Headset (not included). But wait, because we love our readers we have…. 2 BONUS DRONES on a tight budget! We would also like to highlight Hubsan X4 H107C, an amazingly cheap drone (under $30) which is ideal for beginners to fly indoor. It comes with a built-in camera (yes, for less than $30!). It is one of the most sold drones on Amazon, and one of our personal favorites. It’s a neat looking mini quadcopter capable of taking photos and recording video. Camera is 0.3MP and is able to get some good aerial footage. We wanted to mention this drone due to its high popularity, built-in camera, complete package and of course, crazy low price! Note: It comes with a propeller guard, to prevent the drone from crashing when hitting objects. This guard is great for kids, but is also detachable if you want to reduce payload. Second Bonus is… ​UDI Force1 818A! It is one of the most popular drones for kids and beginners. Extremely easy to use and allows for Live Video transmission. U818A is one of the top rated beginner drones by RC aircraft enthusiasts. It has a 2 MP camera, 10 minutes’ flight time and 100 meters’ max range! It’s perfect for kids and beginner thanks to its protective frame. We did an a quick review on this drone here. Are drones under this budget ideal for learning? Yes. In fact, when flying a drone for the first time it’s best to pick a low-cost product that is lightweight, safe, has a steady hover and is aimed at beginners. Most drones on this list are very lightweight, therefore you won’t because any damage when you hit or crash (trust me, it happens to every beginner, even experts). Throughout the article we will specify which drones are better suited for beginners and which ones are not. 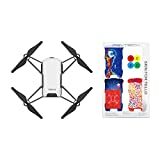 Most drones within the under $100 category are great for children because they are lightweight and don’t have much power. A great drone for a kid must have a protective frame around the propellers and the motor, a steady hover, a responsive control and a plastic frame. We will point out the ones which are best for kids. Don’t forget to share the top 10 best drones under 100$ with your drone enthusiast friends on Facebook and leave a comment down below! Have fun and Happy flying!